I went to the Sacramento Kings versus Phoenix Suns NBA basketball game with a group from work [Matt, Bruce, Brian, Sean and Danny]. Trailing by 10 or more for most of the first half, the Kings outscored the Suns by 10 points in the third quarter to lead by 79 to 75 at the end of the third quarter. They won the game by the score of 112 to 103. Buddy Hield and Harold Barnes were the leading scores for the Kings; they both scored 25 points. Hield was 9 for 20 from the field and 7 for 14 from three. Barnes was 10 for 17 from the field and 5 for 8 from three. Barnes was particularly effective in the closing minutes of the game. Neither got to the free throw line?!? Hield made 7 of 14 from beyond the arc, giving him 245 3-pointers this season. That surpassed the mark of 240 set by Peja Stojakovic in 2003-04. Stojakovic is now an assistant general manager with Sacramento. Devin Booker was the leading scorer for the Sun. He was 32 points on 10 for 27 from the field, 2 for 11 from three and 10 for 10 from the free throw line. Jimmer Fredette signed with the Suns late in the week. Watching him play for the four minutes that he was in the game, I continue to believe that Jimmer does have the speed and athleticism for the NBA game. 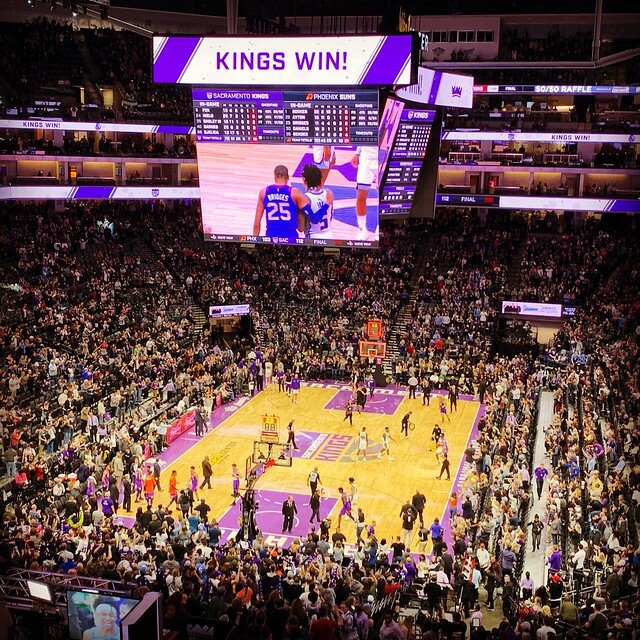 The Kings now have 7 wins and 2 losses in games that I have seen in person during the 2018-2019 season.